Area 4-DK is the ninth course of Warped Mansion and the thirty-sixth course overall in Mario vs. Donkey Kong: Mini-Land Mayhem!. It is a boss fight against Donkey Kong. The level is an arrangement of several Red Girders that can be drawn to reach certain Warp Pipe entrances. 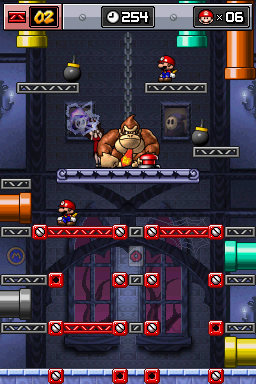 Donkey Kong may occasionally hit a switch, disabling some Red Girder connectors while re-enabling others, while at the same time randomly reassigning each Warp Pipe entrance. He may also pound the ground to cause some Polterguys to fall down; hitting these will cause a Mini Mario to break, though they will disappear after some time has passed. The Mini Marios must enter the Warp Pipes in order to knock down each bomb and cause them to detonate, damaging Donkey Kong. The M-Token is located at the middle left, between the left Warp Pipe entrances. In Plus Mode, it is located at the exact same place. The Mini Mario Card is located at the very center. In Plus Mode, it is located at the exact same place. This page was last edited on February 22, 2018, at 01:04.